How Can You Drive Returns on Your Business Continuity Plan? If you are aware of what Business Continuity Planning is all about, then you might also have heard that it is just another expensive insurance plan you need to keep paying for until the real need arises and doesn’t come with any return on investment. Have you? In fact, this is what most business leaders conclude Business Continuity Planning, or BCP, is. According to a survey by Continuity Central, 38% of business continuity professionals responded that due to lack of budget, funds, and resources, BCP is likely to be a major problem in 2014. Furthermore, 16.4% of respondents confirmed that lack of management commitment, buy-in, and support is an ongoing issue and biggest challenge for BCP implementation. Most of the businesses found it an expensive affair (and you may agree), but what if your Business Continuity Plan could actually reduce your ongoing project management costs? Have you ever thought about it? Have you ever realized that BCP can even provide you with a significant return on your investment? Food for thought, isn’t it? As a technology or business leader, you should not only think about why you need to invest in your BCP, but also its real value and the advantage of integrating it with your day-to-day business practices; don’t just waiting for the need for execution to arise. That’s exactly what we are trying to help you understand by showing you how to drive return on your Business Continuity Plan. Let’s look at those tactics now. A common BCP strategy is a work-from-home policy which is only applicable when a major event occurs in your primary location, such as a chemical leak, fire or Act of God. However, have you thought of implementing it when the impact is less, such as commute delay due to road closure, bad weather, flooding, or something similar? You may think the loss of productivity caused from such disruptions is unavoidable, but that is not true. You can probably use your notification systems to alert your employees on possible natural calamities or traffic congestion and enable them to work remotely rather than wasting significant amount of time trying to commute to your work place. Don’t you think that will increase the efficiency level of your team and organization collectively? However, you should ensure that your employees have all the facilities required to go mobile like laptops, probably a hosted telephone system, internet connection with high bandwidth, remote access ability to your systems, etc, but that should not be a tough task to implement. You need to use your BCP team to ensure you have all the technicalities of remote working facility in place so that you can leverage the capability whenever any kind of event happens which might make an impact on productivity and not just wait for when there is a major disaster. Reducing facility costs can prove to be a very good approach to cut down your organizational expenses. You can reduce your fixed office space and keep it to a bare minimum, leverage a combination of vendor-managed business centers, and have a remote working policy to accommodate overflow whenever needed. 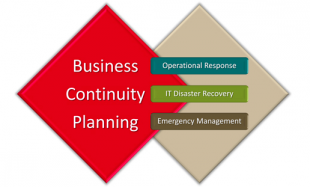 A vendor can provide the most effective solution with business continuity inherent. They would be able to better manage data center costs, improve reliability and availability, reduce capital expenses and deploy a system with a rapid pace. If a major disaster happens at your primary facility, you can still drive your business easily by moving to a mobile approach by using your vendors as you have already ingrained the same in your process. Similarly, if the event happens at any of your vendor-managed business centers, you can move to an alternative location and save money on facility costs. In a nutshell, you have to change your approach to more dynamic from static. You must be aware of how important it is to always have a backup plan in place in every aspect of the business; this is important for your Business Continuity Plan as well. You should emphasize implementing a cross-training program so that you can have a pool of backup staff ready to take over a crisis when the primary is unavailable. Interestingly, it is not just useful for your business continuity strategy, but can also play a very important role in improving your human resource effort as well. Cross-training can reduce the risk of attrition and improve overall organizational capability. Although Business Continuity Planning may seem a costly approach to your organization, changing your approach from being a disaster focused practice to day-to-day business with resilience will certainly fetch you a significant return on your BCP investment. Which plan are you going to implement first? Share your thoughts in the comments! Chandana Das is a Senior Content Writer at Simplilearn and handles variety of creative writing jobs. She has an M.A. in English Literature from Gauhati University. PRINCE2 Foundation certified, she has a unique and refreshing style of writing which can engross the readers to devour each sentence of her write-ups. Connect with her on LinkedIn.